Last year CK was out of town on Mother's Day, to help me through what has become a sad holiday for me, I invited people over for tomato soup and grilled cheese. I got out coloring books, colored pencils, puzzles, and other crafty things. It was a quiet gathering, but full of love. This year was still hard, particularly since it is the first Mother's Day since she's died. I was grateful CK was home and we spent the sunny day working out in the garden together, had dinner out, and watched a show. 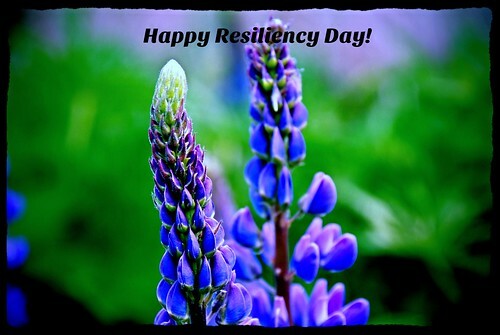 Instead of Mother's Day, I have suggested that instead we celebrate "Resiliency Day". CK has pointed out we could celebrate "Dog / Cat Mom's Day", which is true, but I like the idea of a day acknowledging our resiliency, really celebrating it. Maybe it is just a day where we do nice things for ourselves, like my day of grilled cheese and tomato soup with coloring books. This past Sunday I took a lot of pleasure in tearing out some landscaping cloth and moving rocks as part of a project to reclaim a space to grow veggies in; it made me feel connected to my strength. That's the whole point of celebrating resiliency; celebrating our strength and our creativity in surviving. I'd love to see this idea grow. How we can take a holiday that has become painfully associated, like Mother's Day has for me, and instead use it to celebrate how our creativity, flexibility, and strength helped us to survive, possibly even thrive despite considerable disadvantages. That's my plan at least. I'll celebrate Resiliency Day on any of the dates that give me a bit of a crash. Taking dates, like my Mother's birthday, where it is hard not to be pulled down into anger and grief, and instead focus on how I continue to make changes to live in a way that breaks the generational abuse cycle.